In this recent refresh we made a few changes to our buyer’s guide to make it even more helpful and up-to-date for 2019. In our chart we removed a few guitars that were no longer easy to find, but added one new model – a popular wildcard, the Loog Mini Acoustic Guitar! Parents, there’s a lot of work to be done! Getting your child interested in taking up the guitar can often be a major task in itself, but then come some added headaches – finding the right instrument and equipment, seeking out the right teacher, and keeping them motivated are just a few things you need to consider. Learning to Play Acoustic or Electric – What’s Better? What To Look For When Buying a Guitar For Your Kid? How Much Money To Spend When Buying Your Kid a Guitar? Guitar Lessons – Private Tutoring or Online? And Should You Pay For Lessons in the First Place? But you can take our word when we say it’s worth it! Watching children developing musical skills, expressing their emotions through musical instruments, and just growing and maturing both in musical and emotional terms is a miraculous experience. And in case your kid has shown interest for the might guitar, you’re in luck, ’cause those six-strings just happen to be out thing! We decided to sum up our opinions and tips on this matter in a neat little guide, as well as sift today’s instrument market in pursuit for the best guitar for kids. In case your kid has shown interest in the mighty guitar, you’re in luck, because those six-strings just happen to be our thing! In today’s article we are highlighting our favorite guitars for kids. We have divided our results into two categories – acoustic and electric – and summed them up into concise rundowns for your convenience, as well as offering a short buyer’s guide. Big name, small guitar, big quality, small price! 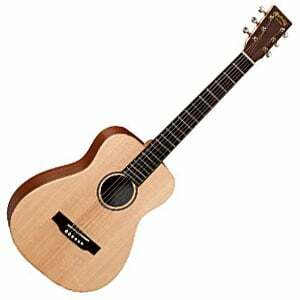 Endorsed by Taylor Swift, this signature acoustic is compact, comfortable and cool! A super-cool compact version of Yamaha’s best-selling electro-acoustic. A great value model from Luna, with awesome lunar-themed design. A cheap and cheerful 1/2 size classical guitar from Hohner. A three-string guitar that makes learning easy and fun. While we love the Baby Taylor, Martin’s LX1 Little Martin certainly gives it a run for its money, offering a big-name guitar at a small price. But it’s not the price that’s the only small thing – this acoustic has a tiny 23” scale length, which makes it perfect for smaller-handed players and travel. The body is made from a HPL mahogany on the back and sides, capped with a solid Sitka spruce top delivering a well-balanced tone with nice warmth. As we mention in the full review of the Little Martin, there are no electronics on this version (check out the LX1E for that), but the hardware it comes with supports the overall feeling of quality. A solid purchase for any small handed guitarist. One of the more expensive child-friendly steel-string guitars on this list, this Baby Taylor features exclusive soundhole rosette artwork and signature of global superstar Taylor Swift. With a compact 3/4-scale dreadnought shape, the Taylor Swift signature – as highlighted in our full review – features a solid Sitka spruce top with laminated sapele back and sides. There’s a tropical American mahogany neck, which is comfortable for smaller hands, and a 19-fret ebony fretboard. The guitar is fitted with great hardware including a set of good quality die-cast chrome tuners, an ebony bridge and Elixir coated strings, and also comes with a great little padded gig bag. It sounds pretty sweet too – well-balanced and quite rich in tone for such a small body. 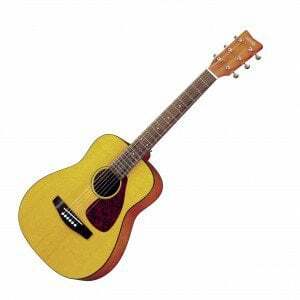 Originally featuring on our chart of acoustic guitars for players with small hands, Yamaha’s APXT2 is also an excellent guitar for kids, with a thinline body and a compact 3/4 scale. It also shows great value for the quality and style on offer. With several color choices, The APXT2 is made with laminated spruce on the top, along with dark meranti on the back and sides. The small, fast neck is very comfortable for kids, with a rosewood fretboard and a total of 21 easily-accessible frets. For kids who’ve advanced past the beginner stage, it features simple Yamaha electronics for amplifying their sound, along with a handy built-in tuner. Our full review of Yamaha’s APXT2 gives you all the details. Switching to the budget friendly domain, we would like to introduce you to one of the best cheap acoustic guitars on the market – the Rogue Starter. The first thing that stood out with this fella is the aesthetic side, as we have to confess that we rarely encounter guitars this cheap (close to $50!) and this good looking. Apart from that, the sound is perfectly acceptable by beginner standards, and so is playability. It’s far from Martin quality, but it still works very well for the budget thanks to a distinctive mid-range punch and a set of bright and clear treble frequencies. Not all affordable kids guitars have to look the same, as Luna’s gorgeous Aurora Borealis is out to prove. This cool steel-string model has a traditional 3/4 scale non-cutaway body and a comfortable small hand-friendly mahogany neck, with a rosewood fretboard. The 19-fret neck and laminated basswood body come enrobed in either pink, blue, black or white, all with a sparkly finish, along with a moon-shaped soundhole rosette and Luna’s intricate moon phase fret-marker inlays. Overall it feels pretty well-built and sturdy enough, while the sound is clear and bright, but well-balanced. As we outline in the full review of Luna’s Aurora Borealis, hardware includes sealed die-cast chrome tuners, stock strings and a simple gig bag. For the price of a couple of pizzas, the Hohner HAG250P is a 1/2 size nylon-stringed guitar that proves it’s much more than a toy. It sports a traditional body shape and construction, made with laminated agathis on the top, back and sides. Mahogany is used for the neck, with hardwood making up the fretboard and bridge. For such a cheap instrument it feels lightweight but sturdy, and is a good partner for kids aged around 5 to 8 learning the guitar for the first time. As we talk about further in the Hohner HAG250P’s full review, the tuning machines let it down a little, but the overall sound is one that’s very acceptable for beginners. For the price, it’s hard to complain. The Loog is a bit of a wildcard on this list, considering it only has three strings. However, it is for this very reason that we include it! This is a bona fide kid’s guitar (not a ukulele), created to help children understand the fundamentals of the instrument and play songs from day one. The guitar itself is basic but fun, made with a cool retro design, real wood and three nylon strings. It’s very playable for those with tiny hands, and – while a bit quiet – it sounds like a guitar should. As we highlight in the Loog’s full review, this mini guitar comes with a selection of handy learning aids, which will help your child hit the ground running. A miniature version of the iconic Fender Stratocaster. Awesome Les Paul style, tone and playability. Probably the best metal guitar for kids. A MARVELous choice of electric guitar for kids. Mitchell’s budget kids model shows off serious superstrat style. Crafted for all the young rockers and blues wailers – or even fresh jazz aficionados – the Strat Mini from Squier is a small version of the company’s highly affordable Bullet model and the copy of the iconic Fender Stratocaster. The guitar features a set of three single-coil pickups and a standard five-way switch that can secure a variety of sounds, ranging from light and bright tone for jazz to a more bass-filled, gain driven tone for rock. We are looking at a sturdy body specifically crafted for younger players, and a brilliant showcase of how Fender knows to hit that sweet spot between quality components and fair pricing. 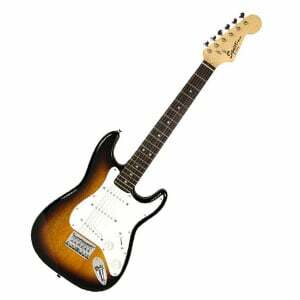 You know what they say about electric guitars – there’s Les Paul guys and there’s Fender Strat guys. And if your kid already falls into one of these two categories from the start, he can already make the first move with the Epiphone Les Paul. What we’re looking here is a trusty replica of the iconic Gibson guitar and its beefy sound, chunky neck, and round shape. For just around $200, this package comes with EVERYTHING, including an amp, a strap, picks, and everything a player needs. This is of great importance, and will be discussed further on up the road. If you’re looking to gear up a young metalhead and a future shredder, go Ibanez! The GRGM21BKN model comes in elegant black, with a 22-inch scale maple neck with low tension. Like any Ibanez instrument, this fella boast an incredibly slim and playable neck piece, perfect for shredding away. The guitar comes with two humbucker pickup, allowing plenty of gain and a strong metal crunch. The smaller size makes the guitar convenient for younger players, and the company made it quite clear for whom they crafted this fella. If you want the best metal guitar for kids, go with GRGM21BKN. If Iron Man played a guitar, chances are this would be it! The powerful Marvel superhero features prominently on the body of this cool 3/4 size electric guitar, aimed at kids and players with smaller hands. The glossy basswood body features the tried-and-tested Super Strat shape, with a reduced 22.5” scale length for excellent playability and comfort. As we talk about in the full Iron Man Rockmaster review, this affordable guitar is quite basic in its hardware, but it all works well. Keeping things simple, Peavy offer a single humbucker (which surprisingly features coil-splitting capabilities), tone and volume controls, and a fixed bridge. As for sound, it’s not the fullest on this list, but quite good for the price. While the Mitchell MM100 lacks a little something in the tone department, what you get for your cash is one good-looking electric guitar! With a small hand-friendly 22.5” scale length, the MM100 features a cool superstrat body with nice curves and edges. There’s a basswood body along with a bolt-on maple neck that features a shallow C shape, an Indian rosewood fretboard and a full 24 medium jumbo frets. The three color choices – glossy Blood Red, glossy Black, or matte-finished Walnut Stain – are all excellent for the price too. The hardware is acceptable and the two humbuckers give a thick distorted tone, which is good for beginner rock! We discuss this more in the complete review of the Mitchell MM100. That wraps up the reviews folks, but there’s more to come! Join us below for a discussion on a variety of factors that you should take into consideration when buying an instrument for your child. Some people say that starting out with an acoustic guitar is the way to go because acoustics introduce the player to the intricacies of the instrument, instead of allowing them to stand behind a wall of distortion and effects. While we agree with this sentiment, we do not agree with forcing a child to play an acoustic guitar. The reason is simple. New players – especially kids – can lose interest easily. By allowing them to play the instrument that THEY want and not what you feel is best, you will probably see improvement in their playing and attitude towards practicing. Learning guitar should be a fun, self-motivated activity, and imposing too many rules can have a negative effect. So, let your child choose which instrument and which style to play. Once they’ve settled on a style, you can browse the fine guitars we’ve listed here and single out the one that suits your child’s needs the most. Apart from that, allow us to assure you that there really is not THAT much difference between acoustic and electric when you start out. Those differences and intricacies will become apparent further along the line, but at the beginning there’s a lot of common ground. The most important thing is to make sure that the interest for playing is alive. As long as they are keen in learning, it is only natural for the player to get the urge to start exploring other sonic realms. So, if you have a little metalhead yearning for some Ibanez shredding, get him or her that Ibanez – even though you may prefer a fine Martin acoustic. Let them learn the way of the axe their own way, then appreciation for other genres will probably come naturally down the line. This one very much depends on your kid’s age. For most of the cases, we believe that either a 3/4 or a parlor guitar can do the trick, but full-sized instruments are a valid option as well. You should keep your eyes open for several things when buying a guitar for a child. First of all – and probably most obviously – kids are small, meaning that you’ll need to be on the lookout for guitars with smaller bodies – meaning parlor guitars or 3/4 models (see above). Most notably, look for necks that are slim and easy to play, with light strings and lightweight bodies. Additionally, be wary of poorly made guitars. The market is full of cheap and nasty guitars that produce a sound so bad that it’s probably better not to buy them at all! Filtering out that stuff was one of the key goals and possibly the most arduous task in our search, and we are proud to say that each of the six-string models listed here pack a decent sound as well as a price tag that’s fair and reasonable. There’s no exact amount – if you are a millionaire, then go ahead and buy them a $5,000 Martin! 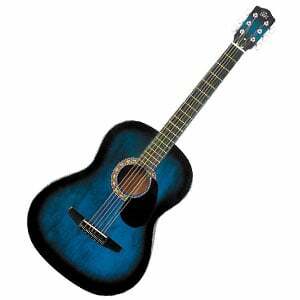 However, in most cases, you can buy a good acoustic guitar with a decent sound for anywhere between $150 and $200. However, if you are on more of a budget, then you can equally find a decent model for under $100. If you are buying an electric guitar, just be sure to factor in around $50 to $100 for a solid beginner’s amp, plus $50 for necessary additional gear such as cables and strap. Read on! This is very important to point out – and we just touched upon it: the price of the guitar is NOT the final amount you will spend. If you want a beginner to be able to play that guitar, you will usually need to set aside around the same amount of money as the instrument for additional gear. In the case of electric guitars, these can’t produce a decent sound without a good amp. You can usually pick one of these up for around $100. To connect the two, you will need a cable, so add another $10 to the pile. While $10 may not seem like a lot, these little bits start adding up. While amps and cables aren’t needed for acoustic guitars (but are still optional for electro-acoustic guitars), the following few pieces of equipment are necessary for BOTH acoustic and electric guitar players. First of all, a good tuner! Even if they tune the guitar at the shop, it will probably be out of tune by the time you bring it home. Even if it doesn’t, it probably won’t be able to hold the tuning for more than an hour or two of playing (strings take some time to ‘break in’). Then what? As a newbie player may struggle to tune a guitar, a tuner is crucial. These are simple devices which are easy to use and will keep the guitar in good shape. In case you don’t know to which notes to tune each string, from top string (thickest) to bottom string (thinnest) tune to: E, A, D, G, B, E.
A metronome is another essential tool for proper guitar practice and development of musicality. This is why we recommend getting a digital tuner with a built-in metronome (widely available). Around $30 should cover it. Up next on the list is a gig bag or a case. While you can take the guitar home in the cardboard box, your child will probably need to take it for a spin pretty soon, whether it’s for lessons or rehearsals. Doing so while carrying it in a cardboard box – or unprotected – is unpractical and risky for the instrument. Again, around $30 to $50 should do the trick. One thing you should avoid buying right from the start is any type of guitar effects pedal. Yes, pedals are great eventually, but you do not want to confuse the basics by adding weird effects or distortion. A beginner should be able to hear the guitar cleanly, so they can tell what they are playing. You will also need a decent guitar strap. Playing while standing up (with a strap) and while sitting down (without a strap) are two completely different worlds, as the muscle positioning is entirely different. Regardless, a strap offers good security even when sitting and should be factored in. Add around $10-$20. Finally, you’ll need some picks, which are around 50 cents each. If you think this is all a bit complicated, you can always go for a good starter pack, which bundles everything together for you in a convenient and affordable package. Here we would have to say new. We believe that the best option is to buy a new instrument and start fresh. Starting with old, faulty gear can have a devastating impact on that musical journey, and we say steer clear from it! That’s not to say you can’t get a good deal in the secondhand department. Bargains are definitely out there – but so are the risks. Therefore, if you are delving into the realms of used instruments, make sure that you either know guitars or bring along someone who does. Apart from that, happy shopping! Answering the latter question first – yes, we believe that kids need lessons. In the absolute majority of cases, kids aren’t fully capable of guiding themselves, making teachers are absolutely necessary. As for the online lessons vs. in-person tutoring debate, the correct answer is – utilize all resources. These days, it doesn’t make that much of a difference whether you’re meeting with the teacher in person or you’re taking lessons through Skype, so we can say that both options are valid. What matters more is how good the teacher is. This is where you need to search for references, reviews from previous students and stuff like that. We have already discussed how essential it is to nurture your child’s natural musical tendencies, so it may be useful to check if the teacher specializes in the styles of music your child enjoys. For example, if they are into blues, then find a good blues teacher. If you’re interested, you can consult our list of the best online guitar lessons for a selection of the best choices out there, all of which have a strong reputation and some of the finest guitar tutors in the world. There are also hundreds – no millions! – of YouTube videos out there. Some are great, some are awful. Some teach songs, some teach techniques, some teach the basics. You may want to sit down and create a playlist for your child if you have the time. There is definitely use on YouTube, providing you find the right channels. Tabs allow you to learn a specific song quickly and efficiently. While tabs are great, concise and easy to grasp, they are also the least efficient tool when it comes to developing musicality. That’s because they mostly teach us to memorize a string of numbers and learn the song by heart and not through the feel. It’s not just that tab users often end up without any scale or music theory knowledge. What is a big issue is that using tabs can turn you into a bit of a robot who cannot improvise, play by feel or compose music, all of which are crucial parts of being a musician. This is not a jab against tabs, but more of a warning. Use tabs, of course – but use them wisely. Music is all about passion, and that passion stems from being a fan of music. You can love music in general or you can love a certain genre – as long as the spark is there, things are good. So, if you want your kid to be passionate about music, being passionate about it yourself doesn’t hurt. Play music, make sure your kid has access to music libraries on the web, discuss music with them, and don’t tell them what they should and should not listen to. Rest assured that being a fan of music yourself will be an important factor when they are learning how to play guitar. We have reached the end of our journey here folks! Hopefully this guide has been of use to you and hopefully you’ve found the right guitar for your child. It’s now time to determine your child’s exact needs, preferences and musical tastes, as well as your spending budget, then single out the guitar that seems the best fit. Don’t hesitate to show your kid some of the guitars listed here – if they know what they want that’s even better! Good luck and don’t forget to thank us when your child becomes a virtuoso! Found my 7 year old grandson a fantastic teacher. Nathan, my grandson, is 7…ABSOLUTELY LOVES his teacher. Wish I had seen your site before I bought his guitar and amp. I paid way too much at a music store. In the end, he is thrilled and doesn’t need to be reminded to practice. 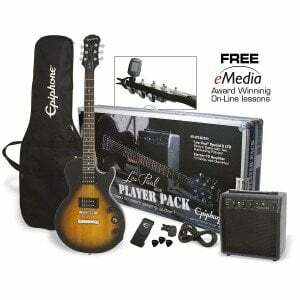 For Christmas Santa can bring him a new guitar and amp. Sounds great Terri – I wish I started learning that young! Good luck to him!